Is the canter your nemesis? If so, you are not alone. We hear from riders all the time who tell us that this is the #1 issue that they struggle with. In fact, honestly... canter issues plague most - if not ALL - riders at some point in their riding journey. To create something different, you have to DO something different. 🥕 You love your horse and want what is best for him/her. 🥕 You put the well-being of your horse first and foremost. 🥕 You've tried everything you know, but it isn't working. 🥕 You may be frustrated with your riding, your horse, and yourself. 🥕 You feel stuck, at a plateau, or unable to make progress. 🥕 You know there has to be a better way. Everything you need to learn how to prepare, train, improve, and develop your horse's canter... yourself. "The next best thing to having Thomas and Shana as your personal trainers." Enrollment is open for registration. It is true. Everything you do with your seat, your aids, and the exercises and movements you ride with the horse can either hinder or help the horse. But it isn't always easy to help the horse, even when you want to. It isn't always easy to know HOW to help the horse. And that is especially true for the canter work. - Perhaps you would like to move up the levels but your canter work is holding you back. - Perhaps you can't even do ANY work in the canter. - Perhaps your horse gets anxious, tense, or inverts in the transitions. Or can't even do them at all! - Perhaps you can get INTO the canter, but you can't maintain it. - Or there are such BIG PROBLEMS in the canter that you tend to just avoid it altogether. You're in the right place if you feel like you and your horse can do better than this. We have taught clinics and instructors training workshops all over the United States, Canada, Germany, Austria, Switzerland, and the Netherlands and we hear it time and time again. Riders struggle with the canter. They learn a bit here and a bit there, and they try to piece it together but it becomes a bit of a mish-mash of tips and techniques that might, or might not work well together, and might, or might not, even be working for that horse-rider team. They tell us how much they struggle with the canter. And how long (often for years) they have been struggling to move beyond the same issues. They want to move forward in their riding. They want to do what is best for their horse. But they are really at a loss when it comes to creating lasting change and actually improving their canter work. I know how frustrating and overwhelming it can be to want to change something in your horse's canter but not know how to do it. I also know that once you have the tools , understanding, resources, and support, that you can do this. You'd love to be able to get to the FUN stuff in the canter. But there's just one problem. You don't know how to get there. Avoid the canter because you don't know how to fix it? Feel like the canter work is holding you back from moving up the levels? Struggle to get your horse to balance in the canter? Get confused about the aids for the canter? Get tense and anxious in the canter work? Not know how to teach the horse to collect in the canter? Lose the shoulder in the canter? Wonder how to teach the horse to do a canter pirouette, or flying change? Struggle with sitting the canter well? Drop his/her back in the up or down transitions? Insert trot steps in the canter to walk transition? Have a flat, scratchy canter with no expression? Or even a 4-beat canter? Leap into the canter or have erratic head movement in the canter? Move crooked in the canter? Do a canter halfpass in one direction but not in the other direction? Get behind the aids and buck in the canter transition? Get disunited in the canter (cross-canter)? You want to feel what it feels like to ride a balanced, connected, uphill, and expressive canter, but you're not really sure how to do that. And you say to yourself..."I need a trainer who can help me with this." We've seen riders struggle with this over and over. So we created a program that will change how you ride the canter forever. Let us introduce you to the canter transformation online course. We created this course to make it fun, inspiring, and empowering to create the canter that you want - finally. When you have the tools and understanding, not to mention resources and support, you no longer get lost in the downward spiral of apprehension, shame, and guilt over not being able to fix the problems. Instead of melting down when something doesn't go as planned, you can regroup and strategize a plan to work through the issue, assured that your plan will work because it is not based on a mish-mash of training ideas picked up here and there, but because it is based on a concrete, coherent, biomechanically-sound system that simultaneously educates the mind and intellect of the horse as well as his body. 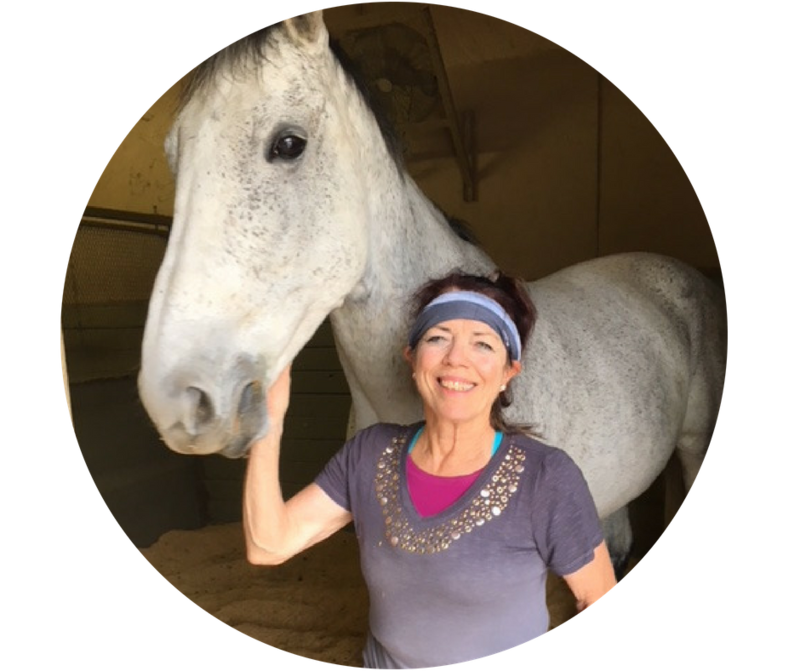 The Canter Transformation course takes seemingly complex and confusing issues in the canter and breaks them down into simple, comprehensive building blocks. Each lesson builds on the previous ones so that as you move through the course, you're building on a solid foundation that sets you and your horse up for success. It gives you the structure you need to really understand how the canter works biomechanically and how to train it, deveop it, and improve it while also giving you the flexibility to adapt it to your needs, your situation, your horse. With the right amount of theoretical foundation, mixed with practical instruction and support, you can learn how to UNDERSTAND the canter. This course DEMYSTIFIES the complex issues and simplifies them into actionable steps to help you overcome the overwhelm and frustration that might be holding you back. We give you concrete tips and suggestions that you can put to work right away - regardless of what level rider you are, regardless of what level your horse is. Their classes have been the absolute best thing for me. The Ritter courses—ALL of them—have done so much to improve my horse and my riding. I came to their classes with anxiety out the kazoo because of my steed. My horse and I had a lot of opposing views that often ended up with me taking unplanned visits to the ground. I have owned, ridden and shown several different horses and been actively taking dressage lessons and clinics since 1984. I have read tons of books and magazines through the years and viewed all the DVD’s and digital content I could get ahold of. The comprehensively organized, yet laid back, approach that the Ritters offer is just the ticket. I can go along at my own pace and partake at whatever speed I choose plus keep all of the course material! Their classes have been the absolute best thing for me. Shana and Thomas are both exceedingly generous with their extensive knowledge. They are patient and very open-minded. Never once have I seen any students shamed and no question is left unanswered. We are made to feel we are on a gentle ship--exploring new and old territory with our horses. Our riding skills are honed so that we become much more humane and efficient trainers all due to their exceptional coaching. I can see a huge difference in how my horse moves. An unbelievable course. Totally outstanding. I have learnt a phenomenal amount and can see a huge difference in how my horse moves. I was nervous at the start of the course that I would be the numpty of the students, but you can learn/study at your own pace and Shana and Thomas were always happy to answer any of my questions. - give you answers to questions you didn't even realize you had. Each exercise is accompanied by an instructional video in which we explain what the exercise is, why you would want to ride it, and how to ride the exercise. We give tips, strategies and advice on what to look out for when you are riding the exercise. 4 theory modules spread throughout the duration of the course. 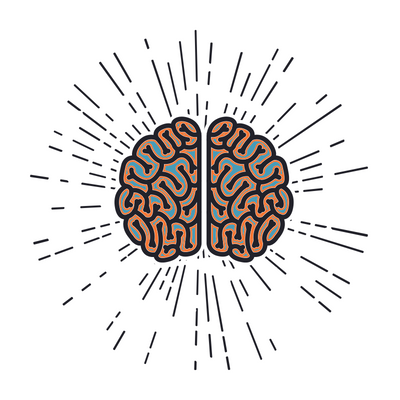 The theory modules are designed to stimulate your mind and cultivate your understanding. Each one builds upon the previous module. 10 exercise modules, one delivered each week of the course. Each module has 4-6 new exercises which correspond to the theory modules, so that you are able to apply the theoretical lessons immediately into your riding. Each exercise has a diagram with detailed instructions explaining what to do, why to do it, and how to do it, often with additional tips for riding the exercise and avoiding or correcting common mistakes, as well as diagnostic questions you can consider to help evaluate the effectiveness of the exercise. Most exercises have additional video footage of the exercise being ridden by a range of horses and riders, with our instructional commentary so you can SEE the exercises being ridden. You can learn through watching what to do, what not to do, and how to correct the mistakes that commonly occur. Whether you work through the materials quickly or at your own pace, you have lifetime access to all of the materials. They become a data bank of resources you can return to time and time again. 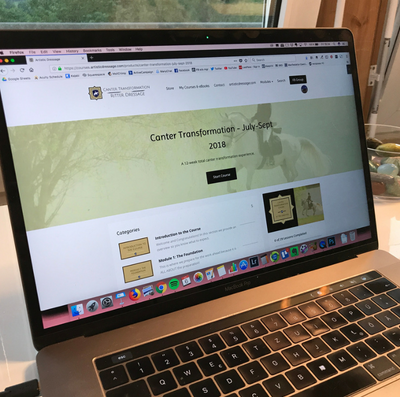 You can access the canter transformation course materials anytime, from anyplace, using your smartphone, tablet or computer. The Canter Course is more about diagnosing and solving these issues than it was riding a more finished horse. "Last July I was working on all the many things I had learned in the What, Why, How Beta Course when I was lucky enough to win a spot in the Canter Course. Then I panicked. Tuxedo bucked when I put him to the canter on the lunge. I was afraid to try to ride that! Gabriella raced around like a train and yes, I was afraid of that too! My other horses were too young.I had seen some of the other course members riding these lovely canters and I felt at a complete loss. Once in the course, I immediately discovered that what I was seeing with Tux and Gabriellla were symptoms and the Canter Course is more about diagnosing and solving these issues than it was riding a more finished horse. Throughout the course, I learned to recognize biomechanical issues and how to develop a horse in order that the issue will go away. "The horse has begun to find his balance, and understand that it is a good thing for him, so on good days, he tries to seek it himself in periods. 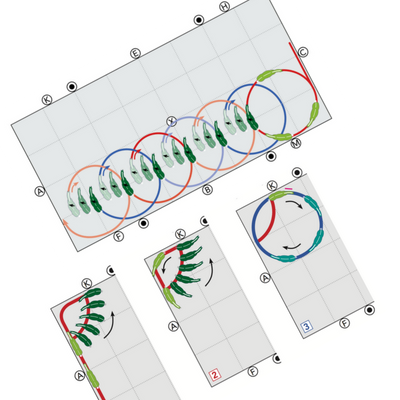 We are currently also playing with changes, and yesterday we managed to to 2-tempichanges around the whole arena (it is an old type portuguese arena, 15x35 metres I think), and we have begun preparing for pirouettes and half-passes. Something that would be untinkable for me when I started the Ritter-courses in February! Those wonderful moments, where the horse and I are both in balance, and I feel that I can use my body as a joystick to shape him and move him around, in a relaxed, but energetic way means the world to me." There is no other program out there like this... it is exactly what WE wished had existed when we were learning to ride. This is the only program that gives you such a comprehensive overview of the biomechanically-based theoretical foundation combined with the practical "HOW TO" broken down step-by-step. It doesn't matter whether you are a dressage rider or not... this stuff works. It doesn't matter what kind of horse you ride... this stuff works. Because this stuff just works. I made a huge leap of faith when I invested in this course, having no experience of how one can learn dressage online. I have been astonished - in a good way - at the depth of information, at Thomas' ability to explain a physical sport through understandable science, and at the improvements in me. It was a spontaneous decision that has permanently changed for the good my approach to dressage, and my horses' benefit from it. Thanks to this course, now I know what I am doing in one aspect of my training! I no longer go round in circles with no purpose. I started in the dark, not sure how to improve on basics taught years ago but knowing there was 'more to it'. I can't believe how much I have learned from Thomas and Shana. I now have the building blocks to work with any horse, not just mine. The improvement in my own horse is measurable. I am so motivated to ride and explore every single day. Massive thank you. I no longer go round in circles with no purpose." It is a system built on evidence-based biomechanics - it works on all horses of all types and breeds. It is based on the psychology of the horse - it cultivates the horse's intellect, curiosity, and partnership. It is based on a humane, heart-centered approach which does not overpower or dominate the horse, nor does it diminish the horse's spirit (or yours!). It is based on the inherent desire of every rider to do the best job they can. To train their own horse in a way that feels connected and meaningful, is empowering, cultivates confidence and intuition, and gives you the autonomy to make your own choices based on what you feel and know is right for you and your horse. You can work through the course in order and then return to it, as needed, using it as a data bank of resources and inspiration. You have lifetime access. It doesn't matter how fast or slow you wish to progress. We support you in your journey by giving you lifetime access to all of the materials. 🥕 Pre-requisites for the counter canter. 🥕 When and how to begin the counter-canter? 🥕 Flying changes or counter-canter first? 🥕 What do you do before you and your horse are even ready to canter? That is what this Bonus mini-course is all about. *** This bonus is In production right now. When you enroll in the Canter Transformation Course, you will be given access to the “Pre-Canter” course as soon as it is completed!! This Bonus expires at 11:59pm CEST on Monday, October 29, 2018. 🥕 An eBook of Gymnastic Exercises specifically designed to help you gymnastically develop your horse's canter. It contains a mixture of previously unreleased, brand new exercises and a few exercises that are scattered throughout earlier Arena GPS editions that we have included here to make them easier to find. This Bonus expires at 11:59pm CEST on Saturday, October 27, 2018. 🥕 Do you have NO CLUE what stirrup-stepping is? 🥕 Have you heard of it but think it is voodoo black magic? 🥕Are you totally confused, intimidated, or overwhelmed with it? Then this Bonus mini-course will be perfect for you. - How this can open up your riding to a whole new level of subtlety and precision. This Bonus expires at 11:59pm CEST on Friday, October 26, 2018. Enroll now to secure these bonuses. Enrollment is open for registration. Secure your spot now. - additional tips and feedback from our 4 assistant teachers. 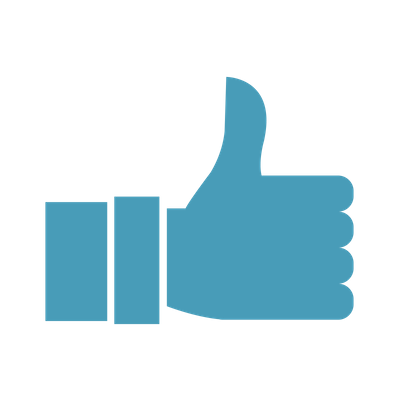 - Exceptionally supportive & helpful community. What do you spend already on dressage instruction, coaching, training, books, and videos in a month? Or what WOULD you spend on instruction/coaching/training if you had access to a trainer you wanted to work with? Look at the Canter Transformation program and what is included, choose the support tier that most resonates with where you are and what you need, and ask yourself this... What would THIS kind of support be worth to you? "To be completely honest, I didn’t really believe that I could ever get my pony’s canter good enough to be able to train flying changes. Bella is a Dales Pony, bred for trotting not cantering, and although I’ve got her over her violent dislike of cantering I never thought I would ever get a canter I could really do anything with. She is also 16 years old now and I’ve had her since she was a year old so I didn’t really think we were capable of a profound change now. Although I have managed to train nice canter transitions she always wanted to drop out of canter at the first possible opportunity. I’ve always been told I need to push her on, to get her thinking forward more but whenever I did it just unbalanced her more and reinforced her (and my) belief that we couldn’t ‘do’ canter. I could always get a nice strike off and usually a few nice strides but that was it, and that’s where we’ve been for YEARS now!!! I quickly toned everything down and asked for much less - just the first couple of strides of passade followed by just a hint of quarters in - and in the last few days she has suddenly and completely blown my socks off!!! She has suddenly found this huge, slow, powerful canter. The first time I was so shocked and taken by surprise I nearly pulled her up! It felt as though I was sitting on a different horse and just didn’t feel like Bella at all. I almost wanted to stop her because I wasn’t sure I was ready or even knew how to ride a canter that powerful! If you’d told me even last week that could ever happen with Bella I’d have laughed out loud!!! At the moment I’m only keeping her in canter for a very short time, partly until she builds up more strength and partly because I’m scared of doing something to ruin and undo it, but for the first time in her whole life she feels as though she’s loving it and really taking me, rather than me having to keep driving her. For the very first time we have a canter which feels as though we really could do things and I really, really had more or less given up on that ever happening. I’m still scared that I’ll get on tomorrow and we’ll have lost it again, but it’s been there for the asking for three days now so my disbelief is fading slowly!!!" - whether you are a novice or professional trainer. - whether you are a dressage rider, a jumper, a western rider, or anything else in between. - whether you have taken every online course out there, or have never taken even one. - regardless of the breed or kind of horse you ride. 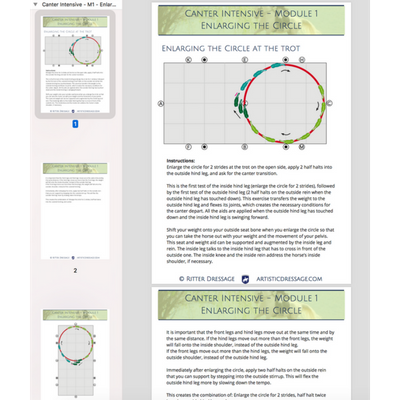 A total of 14 modules which cover understanding the biomechanics of the canter and footfalls in the canter, timing of the aids, qualities of a good canter, faults in the canter, preparing for the canter, the canter transition, seat and aids in the canter, down transitions out of the canter, lengthenings in the canter, improving the quality of the canter, and “shaping” the canter with seat aids and exercises. What level is this course appropriate for? If you currently do work in the canter, are ready to begin work in the canter, or even if you WANT to canter but there are big problems getting into the canter so you avoid the canter work, then it is appropriate. The entire first half of the course concentrates on the preparation for the canter, and this is mostly work you can do at the walk and trot. The latter half of the course picks up from there and explores developing the canter, fixing problems at the canter, upper level canter work, and preparation for the Flying Changes. What type of tack / equipment do I need? A horse to ride, relatively level space to ride in (arena with adequate footing is recommended but our course members have had success even without a standard "arena" to ride in). Not required but recommended: cones or other arena markers, a video camera to record your rides. You should also have an internet connection and a computer or other device with which to access the course materials and Facebook group. What if I can't watch the Q&A's live? No problem. They are all recorded. 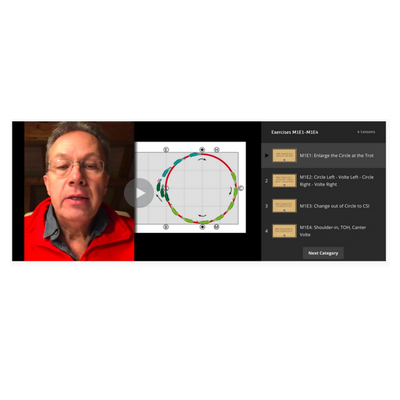 You can watch the recording afterwards in the FB Group, but you can also download the video and audio of the session in the course platform. If you have a question you want answered but cannot attend live, you can post it beforehand. One per week. You have three days to get acquainted with the course platform, join the Facebook group, and work through the Introductory Module materials. Then, on Day 3 your work begins with the first Theory Module and the first set of riding exercises. You are under no obligation to keep up with the course. You have lifetime access to the materials and the Facebook group, so you can work through the materials at your own pace. You can come back to it at any time. What if I want to watch the videos offlline? Every video, every audio file, every exercise PDF, EVERYTHING is downloadable and yours to keep forever. What if I am not riding right now? What if my riding is interrupted by illness or injury part way through the course? We have instructors who no longer ride take the courses and they use the exercises with their students. We have had people recovering from injuries, etc. take the courses. We have had people stop partway through and pick it back up again later. It is not a problem. These are your materials to do with as you wish - work through them at a pace that works for you. Learn the theory first and apply the riding exercises later, etc. What if I want to take the future courses, too? Every canter course member can upgrade to future versions of the course for a nominal fee. Once you are in at the Premium level or higher (we’re only offering Premium level this round), you can attend every Q&A in the course - forever. So your support from us does not end at the end of this 12 weeks. What is my obligation in this course? You can do this course however it suits you. You do NOT need to participate in the discussions or Q&As, but you are welcome to do so. You do NOT need to attend the Live Q&As, but you are welcome to do so. You do NOT need to post video of yourself for feedback, but you are welcome to do so. What if I have questions about the course or trouble enrolling? What if I get into the course but don't like it? No problem. Within the first 30 days we will give you a 100% money-back guarantee. Just email us at ritterdre[email protected] and we'll refund you with no questions asked and no hard feelings, and not only that - you can keep any materials you have already downloaded. Click the button right here. Select your payment plan - you can pay in full, spread it out over 4 monthly payments, or even spread it out over 12 monthly payments. Enter your details and payment info. You will receive an email with your login information and a link to the course platform where you will find further instructions. You will also receive instructions on how to join the Facebook group and the Live Q&A sessions. get in and get started right away. Not sure? Have questions? Just email us at [email protected] and we can help.